When you go to the doctor for an annual check-up you generally hear a lot of the same recommendations from one year to the next. The doctor and nurse usually sound like broken records (at least when I go in for a visit). It can be a little annoying, but they repeat the same common-sense strategies for staying healthy over and over because they're worth repeating. Think about how many times, for example, you've been to the dentist and the dentist has reminded you to floss your teeth. I don't know about you, but I was reminded of that for about 33 years before it finally hit me. I finally realized I was being irresponsible by not heeding the advice of my dentist. I've always had fairly clean, healthy teeth so I generally didn't care to do much other than brush my teeth twice a day. That is, until the popcorn incident. It was a fall morning back in 2006 and I was at an office I knew well. I had been going to the same dentist since I was a kid. While the hygienist was cleaning my teeth she said that she could tell I watched a movie the night before. I told her I hadn't, and asked her why she thought I had watched a movie. The hygienist said that she guessed I had watched a movie because I had popcorn stuck in between some of my teeth. Not exactly Sherlock Holmes, but a pretty good guess. The terrible reality was that I had eaten that popcorn the day before, but not while watching a movie. Even though the hygienist came to the wrong conclusion, the point was clear. When your teeth have "evidence" stuck between them, you know you're not doing a good job cleaning your teeth. I know it's disgusting and I hope you aren't eating lunch while reading this. But I offer up this story to show that the medical professionals giving us advice have a reason for giving it. And relatively smart people can live their lives ignoring the advice. A dentist knows it's bad to have popcorn stuck in your teeth for a few days. You and I know it, too, but we often overlook little details like flossing our teeth because it's simply not part of our routine. For the record, I've been flossing my teeth every day since the popcorn incident. I even take dental floss with me when hiking and camping. I now can't imagine NOT flossing my teeth. It really makes me wonder about all the other great advice I've ignored throughout my life, and it compels me to write down the key strategies for staying healthy. Strategies many of us ignore at least some of the time, if not all of the time. Obvious. We should all exercise. It can even help reduce or eliminate OSA (obstructive sleep apnea) in some people if the OSA is caused by being overweight. This is a great one, because it's not only good for you physically, but emotionally as well. We all feel better when there's less stress in our lives. This one's kinda hard, especially for me. Personally, I believe in moderation with just about everything. You don't have to completely cut sugar out of your diet unless you've got diabetes or another condition your doctor has warned you about. The point here is that you don't have to eliminate sugar and fat from your diet. You may just have to lower the intake. Little steps toward lowering sugar and fat intake can be quite easy. Diet soft drinks, frozen yogurt, baked potato chips, etc. Smoking = lung cancer, heart disease, emphysema, smelly CPAP machine. The list goes on. Increasing fiber intake may not be universally recommended by all doctors, but my doctor has always said that NOBODY - regardless of diet - gets a sufficient amount of fiber without a fiber supplement. Because of my doctor, I've been taking a fiber supplement regularly for the last year. I'm not going to get into the details of the benefits here. The flossing story was more than enough. For a CPAP user, compliance with CPAP therapy can fall under "Reduce Stress". Getting an appropriate amount of sleep (whether you're a CPAP user or not) can also fall under "Reduce Stress". The strategies may be different depending on the individual patient. For example, a doctor isn't going to tell a marathoner that she needs more exercise. That doctor won't tell me to quit smoking because, guess what? I don't smoke. But all the common-sense suggestions - whether they apply directly to you (or me) or not - are good to keep in mind. And it may be useful to write them down, or print them out and post them on the fridge. These are the tasks your doctor assigns to you. I recommend trying to make these tasks a part of your routine. And in case I haven't made it clear, you should also floss your teeth. The issue of making a good habit part of your routine also applies to CPAP users who may not use their CPAP machines consistently. Sometimes, CPAP equipment ends up in a closet because the CPAP user simply cannot tolerate CPAP therapy. Perhaps they don't know how to adjust their CPAP mask to make it fit comfortably. 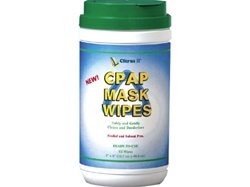 Perhaps the CPAP mask is old and doesn't seal well, which makes CPAP therapy uncomfortable and ineffective. Whatever the case may be, if you've been prescribed CPAP therapy, but it's not yet part of your routine, you need to do everything you can to make it a part of your routine. If you're having trouble with compliance, here are some tips on making CPAP therapy part of your routine. Learn about your specific equipment - how to operate it, how to clean it, when to replace it. Becoming intimately familiar with your CPAP equipment and how it works can help you feel comfortable using it, and can also help you solve problems should any arise. Learn about the positive impact CPAP therapy has on millions of people, and the negative effects of non-compliance with CPAP therapy. Get used to putting on and adjusting the mask during the day, well before bedtime, when you're more fresh and alert. Get intimately familiar with your mask so you know when it's working right and when it's not. When it starts to lose its seal, you should be able to identify that problem so that you can replace the cushion to achieve more effective therapy. In the movie Caddyshack, Chevy Chase's character, golf guru Ty Webb, instructed the young caddy, Danny, to "be the ball". That's what I'm talking about when I say "be the mask". Get advice and support from experts - CPAP users in online forums, CPAP equipment suppliers, your local AWAKE group, etc. Millions of people have been using CPAP therapy for a long time, and they can give you encouragement and specific advice to help you achieve compliance with your CPAP therapy. If you're already compliant, these people can help you improve your CPAP therapy if you feel there's room for improvement. No one wants to go on a CPAP equipment spending spree, but making sure you're using the right products (for example, the best CPAP mask for your particular needs, or accessories that can help you tolerate your therapy more) is important. Accessories like the aromatherapy kit, hose lift, hose cover, CPAP Pillow, and mask cleaner are products you may want to consider. If you have some problems with your current mask, give us a call. We can help troubleshoot the problems, and we can also recommend masks that will address the problems. The bottom line: if you've been prescribed a CPAP machine, then you need to use it to stay healthy. Ignoring this advice from your doctor really isn't an option if you want to live longer with a higher quality of life. CPAP-Supply.com is a good place to start if you need any advice. We're always happy to help.